Look out hipsters: round two of the British Invasion is here! Bringing classics from the original invasion and fantastic originals is a multi-faceted lineup of groups of all ages. At the top of the bill are Yardbirds tribute band The RaveUps. Performing the bluesy psychedelic music of the Yardbirds in an earthy, organic mode, the RaveUps feature lead guitarist Chris Solberg (Santana, Eddie Money, Chris Isaak), bass player Kit Newkirk, singer/harmonica player Dave Seabury, rhythm guitarist Bob Lewis, and drummer Donn Spindt (Rubinoos). 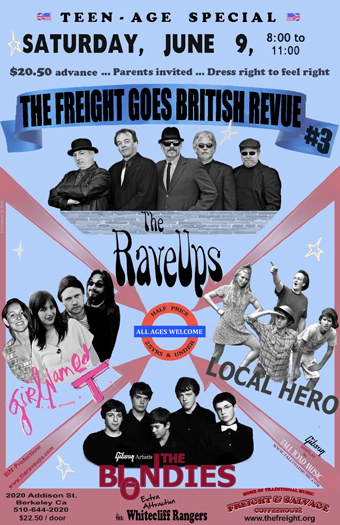 From the hits "For Your Love" and "Heart Full of Soul" to the blues standard "I'm a Man," the RaveUps play high-energy renditions of classics from the British invasion band, recreating the spirit of their original free-flowing jams known as "raves." Berkeley-based indie-pop band Local Hero features Alex MacKay (vocals, guitar), Maya Laner(vocals, mandolin, organ, accordion, ukelele), Max Hirtz-Wolf (bass), and Leo Grossman (drums and percussion). They have performed at venues across the San Francisco Bay Area, from Caffe Trieste to the Greek Theatre. Local Hero released their first EP in September 2011, with a full-length album due in the summer of 2012. Multi-talented, self-taught one-woman music machine Theresa Sawi—the Girl Named T—recently recorded her first full-length album of original pop/rock, which draws on formative influences including the great British and American pop records of the 1960s. With one of her songs featured on MTV’s hit show Awkward and an interview on NPR’s All Things Considered, T gained growing public attention over the past year. The Blondies, music-savvy youngsters with talent beyond their years, shred with the best of them, serving up their own material and tasty covers of classic tunes. The group features Simon Lunche (lead vocals, rhythm guitar), Frank Klopotowski (bass), Zak Meghrouni-Brown (guitar), Jerry Feist (keyboards), and Paul Davis (drums).